We have an energetic youth ministry for junior and senior high school students. 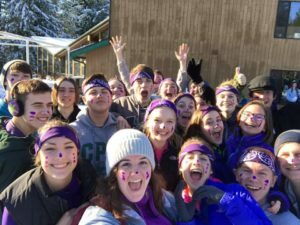 These groups have active schedules with retreats and other activities. A parent permission and medical release form is required for participants under 18. Sunday School: Join us in the portable on Sunday mornings, 9-9:45am, for our new study “Wait…That’s in the Bible? !” where we’ll look at Bible stories that aren’t talked about so often (inspired by students’ suggestions to dig in and talk about the “bad stuff” in the Bible). And, yes, there will be donuts! Youth Group: Wednesday nights in the SCC portable, 6:30-8:00pm, for crazy games (Ultimate basketball? Water balloon launching? Messtival? ), snacks, worship, Bible study, and all around hilarity and fun. Our study topic for the winter is the book of Colossians. For a current youth group calendar, contact the church office. Apr. 21 – Easter brunch between Sunday morning services (approx. 10-11am) – Bring something to share for brunch, and sign up to either set up (during 8:45am service) or clean up (during 11am service). This donations-taken brunch is a fundraiser for the summer Vancouver trip. May 3-5 – Fort Flagler Retreat ~ We have a big weekend of activities planned, including ultimate frisbee, capture the flag in the old fort bunkers, football, awesome worship, an incredible series of Bible studies, and plenty of free time for exploring, hanging out on the beach, softball, and more. This is definitely an event to invite a friend to. Or more than one. Actually, try to invite five! July 15-20 – Vancouver Outreach Trip ~ This summer, we will be going to Vancouver, B.C., to participate in a week-long inner city mission trip. The outreach is intended to give us an in-depth insight into urban ministry in one of the most exciting multicultural cities on the west coast. We will be teaming up with Youth With a Mission (YWAM) Mission Adventures to explore the city, meet interesting people, learn about the various ministries in the city, serve alongside them, and explore different cultures. This will be a very different type of mission trip that will stretch you spiritually–don’t miss out!